I had the opportunity to get on stand Tuesday evening for a hunt. I heard the hogs in the brush on the way in, and knew there was no chance for a stalk through the thicket. I went to stand. At one point counting all the piglets, I believe there were at least 35 hogs within a 50 yrd radius of the stand. 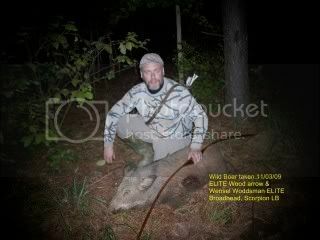 I shot this grey boar at about 12 yrds, he only travelled about 70 yrds. awesome what do you think of those woodsman elites? Woodsman Elite, best BH I have ever used! Tough, did not put a scratch on it with this hog, no bent tip, nothing. They fly great, easy to sharpen, I mean nasty sharp. 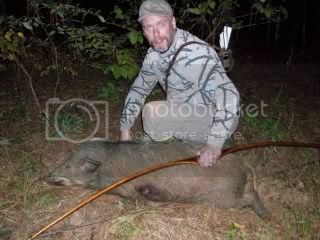 I hit this hog right behind the shoulder through the thick stuff got seven inches penetration with only a 57 pound bow. The hog travelled maybe 70 yrds, if that, and we had blood all the way to him with no exit hole. I am stoked about the broadheads!! Nice! Bringing home the bacon! Awesome Jeff, way to go Bud! Looks like a beauty of a bow too! 4 Sunset Hills and counting! Looking forward to the weekend, hunting on another spot that I have only hunted once.